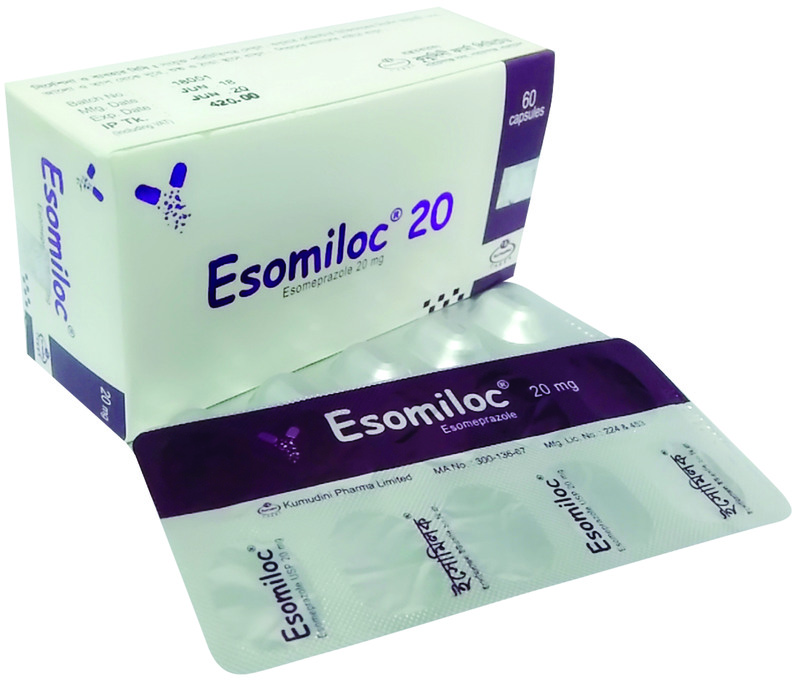 Esomiloc 20mg Tablet Each enteric coated tablet contains Esomeprazole 20 mg as Esomeprazole Magnesium Trihydrate USP. Esomiloc (Esomeprazole) is chemically the S-isomer of Omeprazole which suppresses the final step in gastric acid production by forming a covalent bond to two sites of the H+/K+ATPase enzyme system at the secretory surface of the gastric parietal cell. Esomiloc (Esomeprazole) reduces gastric acid secretion through specific inhibition of the acid pump in the parietal cell, where it is concentrated and converted to the active form. Generally Esomeprazole binds with the enzyme H+K+ATPase and blocks the acid pump. This effect on the final step of the gastric acid secretion is dose- dependent and provides for effective inhibition of both basal and stimulated acid secretion. For the healing of erosive esophagitis. For maintenance of healing of erosive esophagitis. No dosage adjustment is required for the patients with renal insufficiency, hepatic insufficiency and geriatric patients. In patients with severe hepatic insufficiency, a dose of 20 mg once daily should not be exceeded. Esomiloc (Esomeprazole) is generally well tolerated for long term and short term treatment. The most frequently occurring side effects reported with Esomeprazole include Headache, Abdominal pain, diarrhoea, flatulence, nausea and constipation. Other side effects less frequently occured may include Dermatitis, pruritus, urticaria, dizziness, dry mouth less frequently occured. Symptomatic response to therapy with Esomeprazole does not preclude the presence of gastric malignancy. Precaution should be taken in patients treating with Esomeprazole and amoxicillin because serious and occasionally fatal hypersensitivity (anaphylactic) reactions have been reported in patients on penicillin therapy. Patient for long-term treatment (Particularly those treated for more than a year) should be kept under regular surveillance. 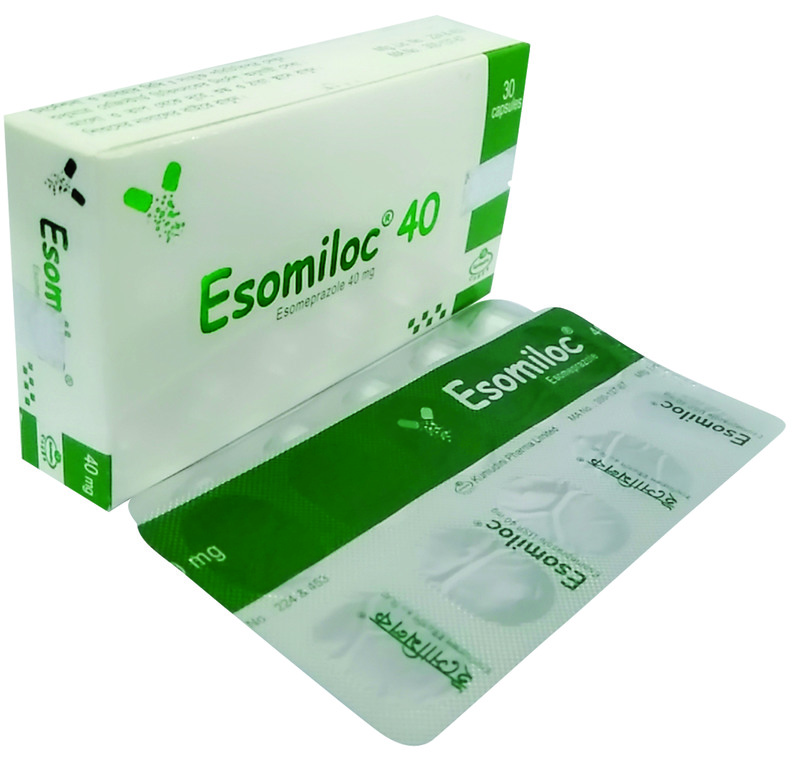 Esomiloc (Esomeprazole) is contraindicated in patients with known hypersensitivity to Esomeprazole or any excipients of the formulation. Esomeprazole is extensively metabolized in the liver by CYP2C19 and CYP3A4. Drug interaction studies have shown that Esomeprazole does not have any clinically significant interactions with phenytoin, warfarin, quinidine, clarithromycin or Amoxicillin. Co-administration of Esomeprazole 30mg and diazepam, has resulted in a 45% decrease in clearance of diazepam. Increased plasma levels of diazepam have been observed 12 hours after dosing and onwards. Esomeprazole inhibits gastric acid secretion. Therefore, Esomeprazole may interfere with the absorption of drugs where gastric pH is an important determinant of bioavailability (e.g. Ketoconazole, iron salts and digoxin). Store Esomiloc at room temperature less than 30°C and keep in cool and dry place, away from moisture and sunlight. Keep the medicine out of the reach of children.